....................................................... This topic is under construction. In Japan, the "unusual" natural phenomena almost invariably has a shrine nearby. The natural "object" may be a waterfall, an old twisted tree, an outcropping of rocks, or some other aspect of nature that ancient Buddhist and Shinto followers felt was associated with a particular deity. Star shrines are sometimes dedicated to the familiar Amaterasu (goddess of the sun). More often, they are dedicated to one of the three gods or deities who were said to be born from nothing and from which all came. Interestingly, these three deities have been associated with a number of "three star" asterisms in the sky including Orion's belt, the three stars that span Aquila's wings, and the three stars we associate with the head of Scorpio. As you might guess from the foregoing, star shrines are usually associated in some way with a meteorite (real or imagined). Certainly, if an old twisted tree deserved deification, you can imagine what a "stone" falling from the heavens must have meant to local people in ancient times. Comets, while seen, were "intangible" and usually considered evil. Meteorites, on the other hand, were "tangible" and seen as a direct gift from the "heavenly deities". Of course, such associations for meteorites were not unique to ancient Japan. Though in a somewhat different way, meteorites still inspire awe. Recent press reports of the furor raised by possible meteorite fragments in the Kanto area attest to the present day ability of these "visitors" to arouse wonder. This, of course, seems to happen all over the world when bolides have been seen or there is any reason to believe that a "stone" may have fallen. Star shrines exist all over Japan, and there are about 80 in Kochi Prefecture alone. Some star shrines indeed were built around an actual fall and still have a meteorite or fragment of a meteorite enshrined. Some have had the original "stone" stolen (for which local people are usually quite embarrassed). In other cases, the original stone was (and is) not an actual meteorite but rather an indigenous (usually round) stone that locals found and thought must be a "stone from the heavens". On the whole, star shrines seem simple in structure, not having the architectural flare often associated with temples and shrines in Japan. Most are usually located in wooded and quite peaceful areas. Star shrine construction, in terms of orientation and alignment, generally has no astronomical significance. Rather, it tends to reflect a mix of aesthetic choice and Confucian pragmatism. 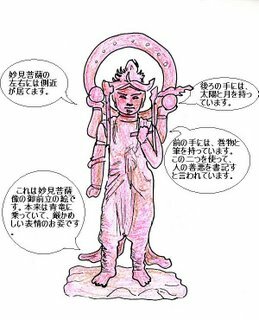 This deity is a purely Japanese Bosatsu, presumably an amalgamation of the Shinto Deity Myooken Shin 妙見神 and the deity of the Northern Polar Star (Dipper). He (sometimes seen as a SHE) has been the protector deity of the clan of the CHIBA 千葉 since the Heian period. This clan later became followers of Nichiren, therefore Myooken is often venerated in temples of this sect. Myooken protects from fires, brings luck and prosperity and heals illness of the eyes. In Edo he was very popular, since there were many fires in the city. So festivals of Myooken were visted by many townspeople and always full of merrymaking. He also takes care of the behaviour of human beings and writes your good and bad deeds in his notebook. 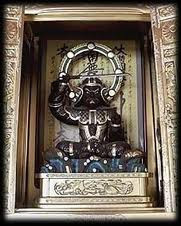 He is also venerated as a special protector deity of the land and country of Japan. He stands on a tortoise with a thick tail or rides a green dragon. He is accompanied by a vasall who carries pen and paper (remember, he registers all our deeds). His hair is long and hanging down, like it was fashion in the Heian period. He carries a sword and a wishfulfilling jewel. Sometimes he is depicted with four arms, two of them carrying the sun and the moon. Most of his statues are made of stone. Er sieht alles und schreibt Gut und Böse auf. Rein japanische Gottheit, als Verschmelzung der Shintoo-Gottheit Myooken Shin, der Gottheit des nördlichen Polarsterns; seit der Heian-Zeit bekannt. Myooken Shin war die Schutzgottheit des Clans der Chiba, die sich schon bald zur Nichiren-Sekte bekehren ließen. Seit der Muromachi-Zeit in Tempeln der Nichiren-Sekte besonders verehrt. Schützt vor Brandkatastrophen, spendet Glück und Reichtum und heilt Augenkrankheiten. Bei den Bürgern der Stadt Edo besonders verehrt, weil es dort so oft zu Brandkatastrophen kam. Die Tempelfeste des Myooken waren immer besonders gut besucht. Als spezielle Schutzgottheit des Landes (Japan) verehrt. Auf einer Schildkröte mit dickem Schwanz oder auf einem grünen Drachen stehend. Begleitet von einem Gefolgsmann mit einem Tintenreibstein und Papier und Pinsel. Lange, herabhängende Haare, Gewand der Heian-Zeit. In den Händen ein Schwert oder das wunscherfüllende Juwel. Manchmal mit vier Armen, dann mit Sonne und Mond in zwei Händen.
. Shrine Hoshida Myoken Gu 星田妙見宮　Osaka . Since Yayoi times, the Big Dipper/Little Dipper etchings have been found carved on pottery for ritual use, so it can be assumed that some symbolism or ritual significance has been attached to the stars in the constellation since those times. Originally a deification of the Polestar (hokushin 北辰) but later also regarded as a deification of the Big Dipper (hokuto 北斗) because of confusion between the two. Although popularly regarded as a Bodhisattva, bosatsu 菩薩, and usually referred to as Myouken Bosatsu 妙見菩薩, properly speaking she belongs to the category of divinities (*ten 天), and in the jimon 寺門 branch of the Tendai 天台 sect she is equated with *Kichijouten 吉祥天. She is invoked in particular for apotropaic purposes and also for the healing of eye diseases. 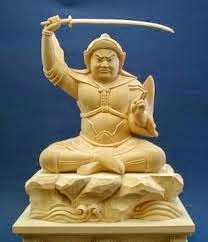 In Japan she appears to have been widely revered as early as the Heian period, and in medieval times she came to be worshipped especially among powerful provincial clans as a tutelary deity of the warrior class, evolving into the partially Shintoized deity Myoukenjin 妙見神 . At the same time she was also adopted by the Nichiren 日蓮 sect and remains the object of a popular cult today. Artistic representations of Myouken exhibit considerable diversity, and there is a set of twenty-six paintings, all different, at Daigoji 醍醐寺 Kyoto, but generally speaking she is depicted with either two or four arms and either seated on a cloud or standing on the back of a dragon. Myoukenjin has a halo showing the seven stars of the Big Dipper and holds a sword in one hand. 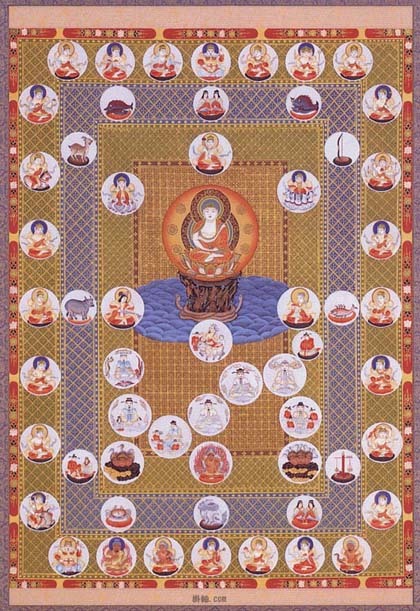 There is also a mandala, 曼荼羅 centred on her (Myouken mandara 妙見曼荼羅). Once there was a house in front of the Kisakibe-dera in Ate district, Kii province. As ten silk robes were stolen from the owners, they prayered devotedly through Bodhisattva Myoken in the temple. The stolen silk robes were sold to a merchant in Kii. Hardly a week passed before a gale hit, and the robes were whisked south on the back of a deer to the original owners' garden; the deer then disappeared in the heavens. The merchant who had brought them, hearing that they were stolen goods, did not ask for them back but kept quiet. The Chiba clan was the leading powerful clan of Kanto which it not only reigned throughout Chiba, but extended the influence to long distance Oshu or Kyushu once. "Myoken Bosatsu" deifies the polestar and the Big Dipper. Mr. Chiba believed in it as the whole family's guardian deity. The translation is said since "Myoken Bosatsu"　of "Seven Star Mountain Safe Temple" made the rain of a sword fall on an enemy's head and saved the crisis, when Yoshifumi Taira who is Mr. Chiba's beginning fought with Kunika which is an elder brother in the Ueno country Gumma-gun with Masakado Taira in 931. 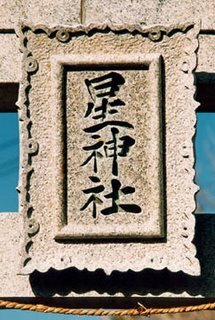 The Chiba's family crest originates in "Myoken Bosatsu" which deified the polestar in which it believes, and the Big Dipper. The strength of the faith to the Chiba whole family's star is expressed well. It moves to Chiba, and Tsuneshige which is the posterity of a right sentence will build the Chiba castle in the present Inohana ruined castle park, and will have the powerful military strength in it. And Tsuneatsu appeared. Yoritomo Minamotono who raised an army in Mountain in Izu is beaten by War, goes over the ground in Boso, and will measure recovery in 1180. At this time, the powerful clan-band of warriors of the Kanto whole place all sided with Yoritomo, and the Kamakura shogunate was born from information that another influential person of Tsuneatsu or Boso and the extensive usual state of Kazusa sided with Yoritomo. By activity at this time, the Chiba whole family hardened large powerful clan's status as a vassal of the Kamakura shogunate. However, Mr. Hojo took lessons from the status of Shikken, and it became weak gradually. Starting from here, I checked about some of these shrines. At the end is a list of most shrines. 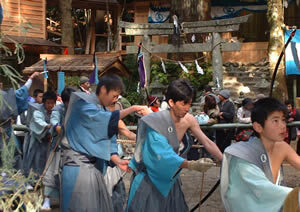 A Arrow Shooting Ceremony on January 8 of Years with an uneven number、every second year. Sometimes even a Tengu Goblin shows up for the festival, they say. List of the shrines with a Stone (meteorite) reverd as God.
. Tono Hachimangu 遠野郷八幡宮 . A white stone fell down from the sky and is now venerated. ［星神社：千葉県］ Hoshi Jinja, Chiba Pref.
. Tamawakasumikoto Jinja 玉若酢命神社 . Even a Daruma Market is held here. The origin of the shrine name is not clear. Every Year on the 12 and 13 of April. During the festival, there is a performance of the local Drummers, clad as Namahage Demons of the area. 千葉神社 Chiba Jinja. Memorial Shrine of the Chiba Clan. Detail of foundation is not certain,but the deity is Takehatsuchi-no-mikoto, the tutelary god for Kuji-cho. 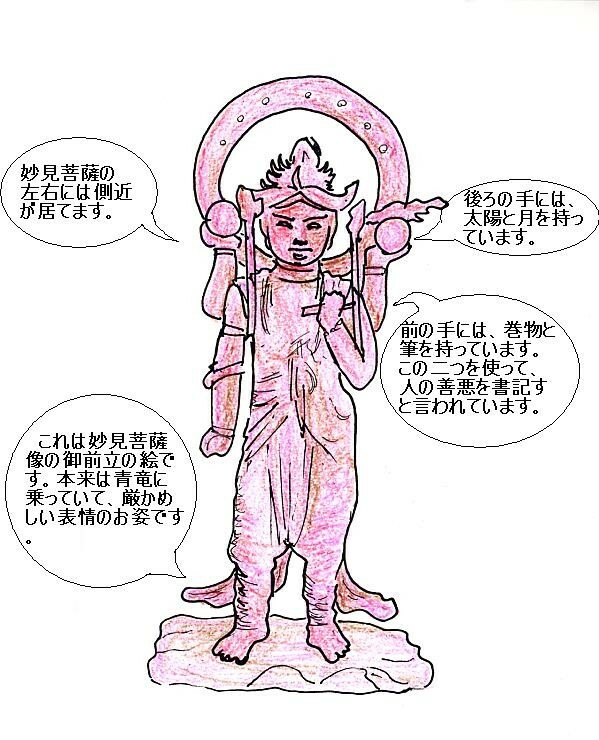 It says in the classic document that a strong evil god,called Mikaboshikakaseo, occupied Ohmika area,took up his base camp on the top of Mount Ohmika, dominated over north-eastern district. Takehatsuchi-no-mikoto,ordered the important charge to conquer the evil god instead of two gods in Kashima and Katori,succeeded to defeat the evil god, and suppressed Hitachi area.He stayed in Ohmika,and brought industrial development into practice such as salt and textile manufactures. Huge pasania trees and other many kinds of plant are thickly grown in the grove of Ohmika Shrine,this grove is appointed as the natural monument of Hitachi-city. 天から落ちてきた石をご神体とした神社. A meteorite is venerated. ［押坂神社（長野県下伊那郡)］ Kamisaka Jinja. Nagano Pref. ［音無神社：伊東市］ Otonashi Jinja, Ito Town Shizuoka. Tengu is said to be a kind of shooting star (流れ星 nagareboshi) as a bad omen for the near future but also possess miraculous power to help against it. This might be the connection between Tengu and Fudo in the Star cult of Japan.